Followers of Sebastián Piñera await his arrival in Osorno, Chile on November 9, 2017. The presidential candidate and former president of Chile Sebastián Piñera met with his followers in the city of Osorno only a few days before the elections. (Photo by Fernando Lavoz/NurPhoto/Sipa USA). All rights reserved. Presidential elections in Chile will be held today, Sunday, November 19. All the polls indicate that former President Sebastián Piñera is the most likely candidate to win a majority of votes, although not enough to win outright in the first round. The question that puzzles the experts, however, is not so much who the runner-up will be, or the percentage of voter turnout, but how many people will actually vote. In 2012, Chile passed a bill changing the vote from compulsory to voluntary, and it is now the Latin American country with the lowest voter turnout. The picture becomes liquid when the likely voter universe is not known. It is worth remembering some of the reasons behind Piñera’s probable return to the presidency. During Michele Bachelet’s first term (2006-2010), the parties in her coalition had significant clout, their policy program kept on refining the political model established since the re-establishment of democracy, and they had substantial citizen support. But the coalition failed to define a clear electoral strategy, chose a bad candidate, and so Sebastián Piñera won. Bachelet's approval ratings when she left La Moneda’s presidential palace were more than 80%, and she was fully aware that she would be a good contender to win the elections four years later. Piñera’s government (2010-2014) was marked by problems between the parties in his coalition and the downfall of the slogan “the government of the best" – that is, former private company managers who knew little or nothing about running the State. Later in the term some important political actors joined the government and gave the coalition some structural order, although the parties recognized both in public and in private that the President did not often communicate with them. 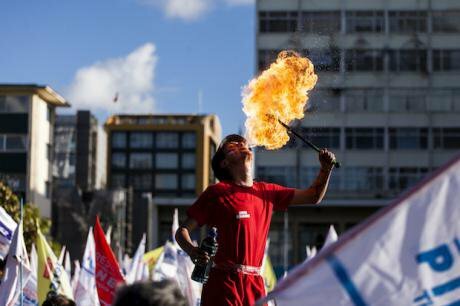 Piñera had to manage the consequences of Chile's biggest earthquake in decades, the student demands, and the development of a reform agenda by the Left. Economic and social indicators, in the whole, improved during his term. But with Bachelet's ghost haunting the following election campaign, the right-wing coalition went through a generalized crisis which led to its electoral defeat. Bachelet returned to the presidency of the scountry as an indisputable and basically incombustible candidate. This time, she took advantage of her political strength to create a team composed by people of her personal entourage. She also distanced herself from the parties and the party leaderships, and defined a program of important social reforms (free university education, abortion on three counts, reform tax, labour reform, constitutional reform). However, shortly after assuming the presidency, corruption scandals linked to her son and daughter-in-law broke out. This, combined with an apparent lack of coordination between the economic and the political teams in her government, the daily struggle with problems that got in the way of implementing her reformist agenda, and doubts among the coalition partners, weakened her, her government, and her center-left coalition. Undoubtedly, history will remember some of the reforms which were established under her second presidential term in Chile as substantial changes but, this time, Michele Bachelet is leaving with a mere 25% approval rating and an imploded center-left coalition. So, in the 2017 elections, there are two candidates, both considered to be center-left, and both members of coalition parties in the outgoing government. Christian Democracy has gone its own way and has decided to field a candidate, Carolina Goic, who will surely will cost the party some seats, but it will open up the discussion for a clearer programmatic future. The candidate representing the other party in the government coalition, Senator Alejandro Guillier, could very likely be the runner-up for the second round in December. Guillier, an independent candidate supported by one of the smaller parties in the coalition, has shown himself erratic in some decisions and too discreet in his public appearances to thrill the popular center-left voters, which means that these voters may well refrain from participating in the elections today. So, he will need to reinvent himself if he wants his chances of winning in the second round not to be remote. Piñera, meanwhile, has understood that governing includes putting in order a party coalition, and keeping public and private confrontations at a minimum, that holding power and running a government is not just management, and that a government agenda needs to be based on ideology rather than administrative functionality. A candidate from a harder right has emerged, but he will not apparently win a relevant percentage of votes. The election today is key to the political development of what is considered to be the most institutional and orderly country in the region. Possibly, the greatest challenges ahead will have to do with citizen disaffection, the urgent need for change in the leadership of the traditional parties and the consolidation of new, serious political references and truly alternative proposals.